Gulfwind Sailing Academy is a team of experienced offshore sailors offering delivery services for yachts around the NZ Coast and offshore sailing to and from the Pacific Islands. We have the knowledge and skills to safely deliver your boat to its new port. We respect the trust owners place on us. Our years of blue water sailing experience has ensured that careful preparation, regular watch keeping and keeping the boat safe at all times is essential for the safety of the people on board and the yacht. At the same time we can provide tuition for you and your crew during the planning of the passage and the actual delivery itself. Extra crew can be arranged if required. This pricing is by negotiation, but the details below should give you a rough estimate. Also note that the prices below do not include costs of items like provisions, running of the vessel, additional crew (if required) or cost of relocation from Auckland. We returned safely to Canada, and Gerda and I are recuperating from the long flight home. We both want to thank you and Sheryl for the fantastic Sunday day sail we had with you both. It will be remembered for a long time especially the after sail drink at the Royal New Zealand Yacht Squadron. Wishing you success with your sailing business and thanks again. Thank you so much for an extremely enjoyable and useful three days last week. We honestly don’t believe we could have had a better introduction into sailing and it has certainly kindled our desire to persue this “art”. You obviously have a passion for sailing which came across and was very inspirational – having a passion for sailing is one thing, being able to communicate it and teach it as effectively as you did is quite another! Many thanks again, and best wishes to you and Sheryl. 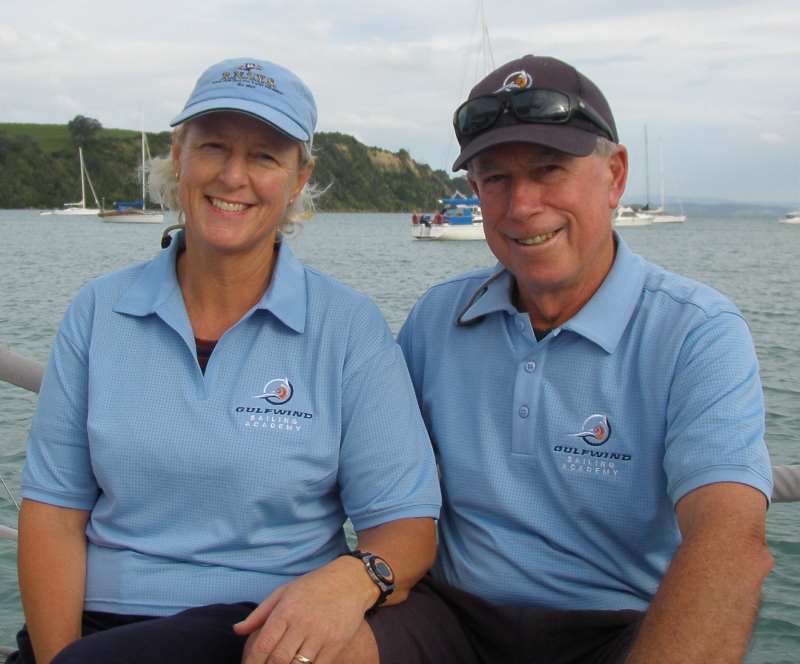 Mike Lanigan, Sailing Director of Gulfwind Sailing Academy, has over 20,000 blue water miles plus over 20,000 NZ Coastal miles. Sheryl Lanigan also has done many offshore blue water miles including a Sydney to Hobart race (as navigator) plus also many NZ Coastal miles. They have a life time involvement with boating.